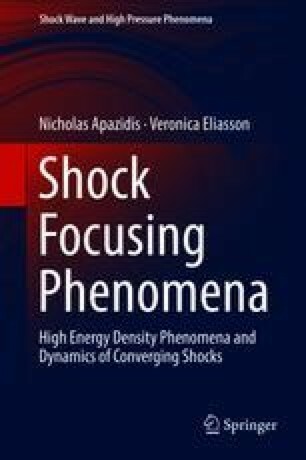 In the beginning of this chapter, we give on overview of early experimental work on generation of converging shocks by various methods ranging from annular shock tubes to cylindrical as well as spherical explosion chambers. These early experimental results along with Guderley’s solution raise important questions of self-similarity and stability of converging shocks. Experimental results showing the dependence of the power-law exponent on the adiabatic exponent for various gases are presented and discussed. We then give an overview of theoretical and numerical results on the stability of converging shocks based on the theory of geometrical shock dynamics. A number of experimental results on shock convergence show that converging shock experiences tendency toward planarity, e.g., generation of plane sides and sharp corners in initially cylindrical shock front. In this respect several sections of this chapter are devoted to experimental as well as numerical work on convergence of polygonal shocks and their ability to preserve symmetry and thus enhance the final energy density. Production of cylindrical and spherical converging shocks by a gradual change in the shock tube cross-section has been proposed by several researchers. We discuss the basic theoretical and numerical results as well as their experimental realization leading to extreme conditions at the focal area with gas temperatures in excess of 30,000 K. The end of this chapter is devoted to shock generation and focusing in water by means of exploding wire techniques. Experimental findings showing extreme states of matter at the focal area of a converging shock in water generated by a moderate input of initial energy are discussed.